We’ve officially reached the few, somewhat cherished, months of the year in which there’s a little bit of a lull in the American horse show calendar. For the horses that I have the privilege of riding and working with, that means a bit of extra time at home in Illinois without being ridden every day. For me, it means regrouping, doing some inventory of our tack and some re-organization at the barn, and reflecting on the past year while simultaneously starting to think about the year ahead. This past year was a big one for me and for Michelle Durpetti, who owns my high performance mount, Cassius, and whom I have the privilege of training for the amateur hunters and jumpers. 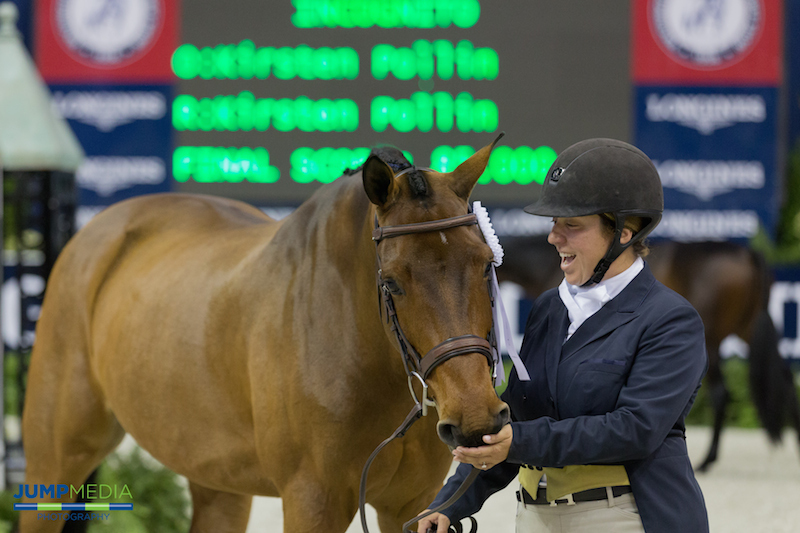 Most recently, we wrapped up our “indoors” season spent at the Capital Challenge Horse Show (Md.) (which I blogged about here), the Pennsylvania National Horse Show and the Washington International Horse Show (D.C.). Cassius was a star in the high performance hunters, with his top score coming in at 85.5 for a third-placed finish in a class at Harrisburg. I’ve said it in previous blogs, but this year we really threw Cassius a bit into the deep end to either sink or swim—and he swam like he was Michael Phelps! I put a lot of work into Cassius this year, and to think about where he was in January versus where he is now is kind of crazy. 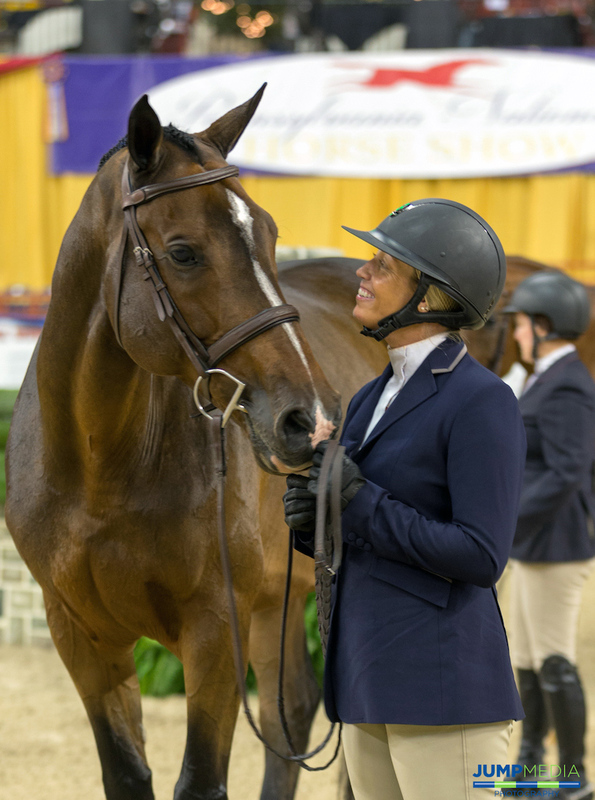 For Michelle, indoors was perhaps even a greater success—especially at Washington where she and her horse, Lucca, finished fourth and fifth over fences in the low amateur-owner, 36 and over, hunters. Michelle only moved up to the 3’6″ at the end of Florida this year, so she did a lot in a short period of time, and it makes me so proud as a trainer to see how far she has come and to watch her confidence grow in both the hunter and jumper rings. As a whole, I think this year went extremely well for us. We set a lot of goals for ourselves and our horses, and now it feels great to know that we accomplished what we set out to do. For Cassius and me, setting and meeting the goal of going to USHJA International Hunter Derby Finals (Ky.) was huge (and I blogged about here, here, and here). Having the opportunity to be there, gain that experience, and work that week with Andre Dignelli, who is a huge mentor for me, was incredible. I also set and met the personal goal for myself and my jumper, Cavalier II, of moving him up into the bigger jumpers and starting to jump grand prix classes. I’ve had him as a project for a couple of years now, and this year I felt like we cleared a hurdle with his maturity level, and it’s been exciting to see him really start to develop in the ring and climb to that higher level. Michelle and I had a small group of horses this year, and those horses did a lot of work and a whole lot of development throughout the year. There were highs and lows, but that’s horse showing, and that’s life. It’s really exciting to see how far our horses have come and to look back on the goals that we’ve accomplished in just 12 months’ time. It’s also exciting to begin to think if that’s what we accomplished this year, what might we be able to accomplish next year as we only build from here? All of the goals that we met this year were not only goals for the year, they were stepping stones to what lies ahead. For Cavalier II, I hope that means continued grand prix appearances and continuing to step up. For Cassius, it means going a new direction as Michelle takes over the reins and transitions him into the low amateur-owner hunters. She’s really looking forward to showing him, and I think it’s going to be a really awesome match. Michelle also wants me to stay a part of Cassius’s program, so I’ll continue to compete him in derby classes as his new amateur-owner schedule allows. For me, that’s the best part of doing this with Michelle; she puts as much consideration into my goals as she does her own—and I know we both have some big ones! Before we tackle those objectives though, I’ll be enjoying these next two months to look back on 2017 and look ahead to how the work we put in and the goals that we met this year have prepared us for the next steps. I look forward to continuing to blog here on The Chronicle of the Horse’s site throughout the winter and as we kick off our 2018 show season! Born and raised in Sheffield, Mass., Caitlyn Shiels began riding at the age of 8. 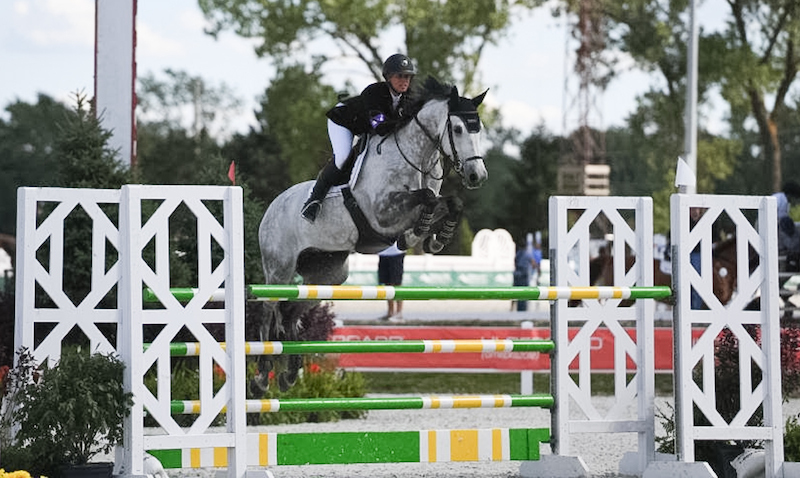 In 2013, Shiels joined the team at Canterbury Farm in Hampshire, Ill., as a trainer and rider, training hunter/jumper riders to compete on the local, regional and national level. Read all of her COTH blogs.